We’re baaack! Did you miss us? We, us, Cliff and Nancy, recently returned from a vacation trip that was billed by its promoter, Holiday Vacations, as the “trip of a lifetime.” Was it ever! Never having visited the Pacific Northwest and the Canadian Rockies, we signed on to take a group tour of some of the most majestic and beautiful landscape in God’s creation. Along with our professional tour director, Penny Lamb, and tour host, retired WOOD TV8 Chief Meteorologist Craig James, we were placed on the doorstep of one wonder after another. Our mixed tour group of 40 travelers hailed mostly from West Michigan along with two smaller groups from Virginia and Montana. 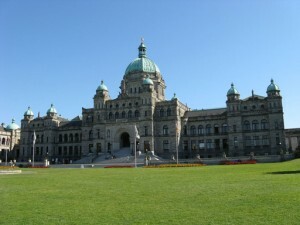 We traveled by plane, by luxurious motorcoach, on cruise ferries, and on the incredible Rocky Mountaineer Train. From start to finish, every detail of our 10-day adventure was all-inclusive and arranged by Holiday Vacations. We were led by Lamb, who prides herself on delivering unsurpassed personal service so we all could sit back, relax and leave the details to her. Meals and accommodations throughout were top shelf. James guaranteed the weather and came through with 10 bluebird days without a drop of rain. He even managed to have all our plane connections on time with no lost luggage to boot! On day one, accompanied by Lamb, the West Michigan group departed from Gerald Ford Airport on Delta Airlines to make a connecting flight and hook up with the two smaller groups in Minneapolis. In Seattle, Wash., we spent the late afternoon and enjoyed overnight accommodations with an incredible unobstructed view of Mt. Rainier from our hotel room windows. local attractions. At points during each motorcoach tour, we disembarked to get a first-hand feel and taste of what we were seeing. We could write a book about what we experienced on this tour. But unless you had experienced it yourself, words would not suffice. 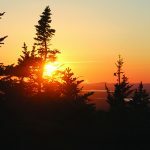 This is really a story of natural wonders, of breathtaking vistas, endless snowcapped majestic mountains, rushing streams, waterfalls, azure blue lakes, and abundant wildlife. We even witnessed a lightning-caused forest fire on the train segment. 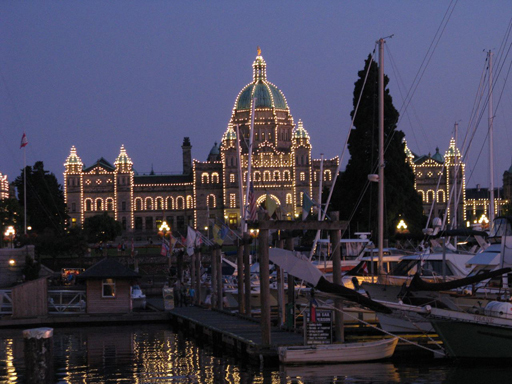 All along the way, we were struck by the hospitality and friendliness of our Canadian neighbors to the north. 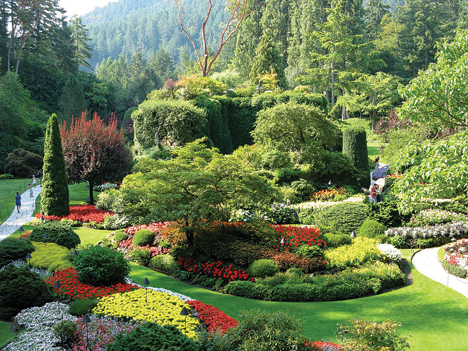 Too numerous to individually mention, some of our favorite trip highlights include Butchart Gardens in Victoria, Capilano Suspension Bridge (including a walk in the rainforest treetops), the amazing Rocky Mountaineer Railroad, glacier-fed Moraine Lake, and the Columbia Icefield of the Athabasca Glacier in Jasper National Park. 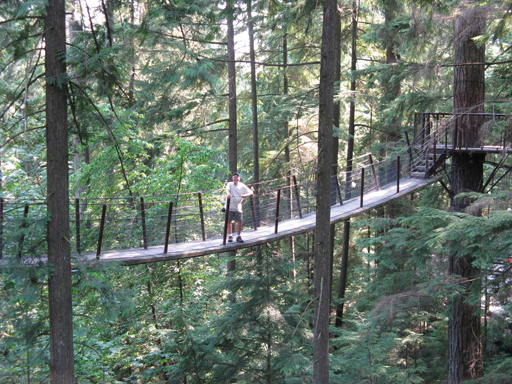 A natural wonder of the City of Vancouver, B.C., is the 120-year-old Capilano Suspension Pedestrian Bridge that stretches 450 feet across and 230 feet above the Capilano River Canyon. Swaying gently in the breeze and from foot traffic, crossing it one finds themselves with a pounding heart in their throat. 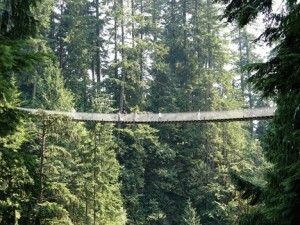 Not to worry, the bridge was originally suspended on hemp rope but today uses two-inch steel cables capable of supporting two fully loaded 747s. Beyond the bridge we continued to a staircase where we ascended to a series of seven smaller bridges suspended between platforms that circled trees in the cedar and Douglas fir forest. This stroll in the sky, as high as 10 stories, gave us a unique and breathtaking close encounter with the very heart of the rainforest. 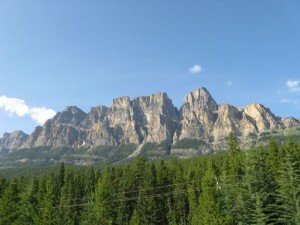 Billed as “THE MOST SPECTACULAR TRAIN TRIP in the WORLD,” the segment aboard the Rocky Mountaineer Train was the focal point of the tour and far exceeded our expectations. 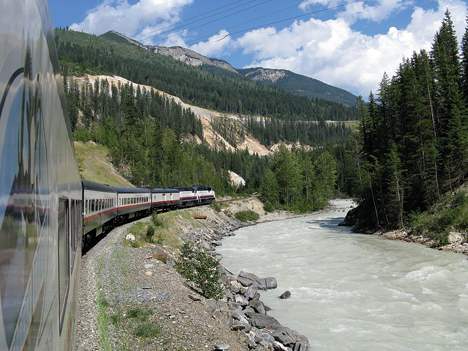 The tourism dedicated train system provided us with a two-day, all-daylight journey through Canada’s west and into the Canadian Rocky Mountains. Our train traveled at the leisurely pace of 45 mph, so passengers would not miss close-up views of jaw-dropping scenery. The train laid over in Kamloops, B.C., on the evening of the first day so we could spend the night in a comfortable hotel. The next morning we again boarded our train to head to our second day destination, beautiful Banff, Alberta, in the national park of the same name. En route, we crossed multiple bridges over river gorges, traveled along the edges of precipitous drop-offs, and viewed mountain vistas that put our own Colorado Rockies to shame. Approaching Moraine Lake, our tour coach driver repeatedly asked us the rhetorical question, “Are you ready for this?” As we turned a final corner to suddenly witness Moraine Lake, a collective gasp was heard inside the coach. Moraine Lake is a glacially fed lake in Banff National Park. 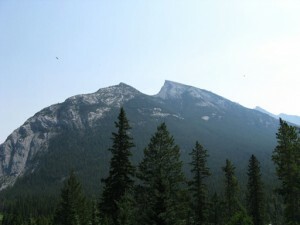 It is situated at the foot of Peak #10 in the Valley of the Ten Peaks, at approximately 6,200 feet. 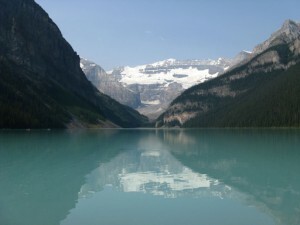 The lake, against the backdrop of the mountains surrounding it, reflects a distinct and indescribable shade of blue. The color is due to the refraction of light off the rock flour deposited in the lake on a continual basis. Last but not least is our personal favorite experience. Some 120 miles north of Banff we witnessed firsthand a natural marvel, the Athabasca Glacier, one of the eight major glaciers of the Columbia Icefield. 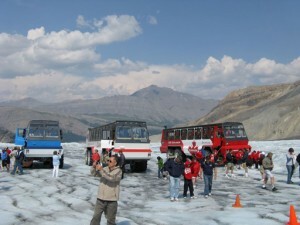 The Columbia Icefield is North America’s largest sub-polar body of ice. 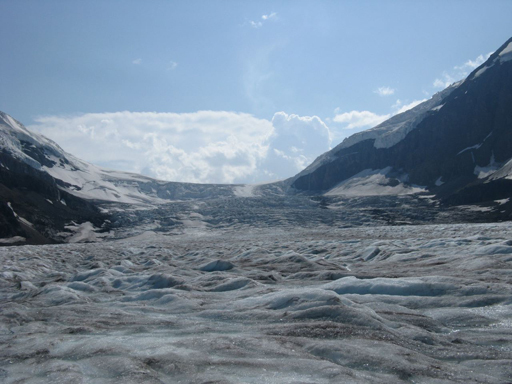 The Icefield encompasses 125 square miles of ice as deep as 1,200 feet. (You could fit New York’s Central Park 95 times inside the Icefield.) Being at the Continental Divide, both east and west and north and south, its meltwater drains via rivers into the Pacific, Arctic and Atlantic oceans. 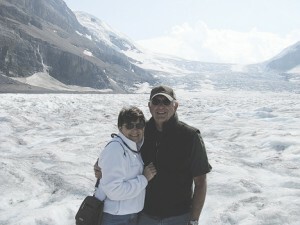 At the Icefield visitor center, we transferred from our motorcoach to a Brewster Glacial Explorer. The Glacial Explorer is a bus on steroids. The Brewster Company owns 22 of the huge specially made vehicles. Aside from one at McMurtough Sound Station, Antarctica, they are the only ones in existence. Each weighing 60,000 pounds (30 tons), the vehicles sport six huge low-inflation tires for traction and passenger comfort. Transported by the Glacial Explorer to the surface of the Athabasca Glacier, only the adventurous among us stepped out onto the cold windswept surface. For our 20-minute visit, everyone stays within an area designated by orange pylons: the glacier has some 10,000 crevasses. Scanning the expanse, which resembles a frozen stormy sea, it’s hard not to feel how small we all are in comparison to this landscape. On this day, we also visited other such glacially fed lakes as Lake Louise at the foot of Victoria Glacier, Peyto Lake at the base of 7,000-foot Bow Mountain, and even countless more mountainous vistas were seen through the huge windows of the motorcoach. We’ll never forget the day of traveling along the Icefields Parkway, one of the most beautiful highways in the world—not one billboard mars the roadsides of Alberta. All good things must end. In Calgary, on the final evening of our tour, while enjoying one last sumptuous meal, we reminisced with those who 10 days earlier were just travel companions and now were close friends sharing memories of a lifetime. The frozen sea of ice of the Athabasca Glacier (as deep as 1,200 ft.) as it is being pushed by the 150 ft. tall leading wall of the icefield as it passes through a mountain valley on the far distant horizon. Other than a mini-vacation cruise on the “Badger,” we had never taken advantage of a tour package vacation. We loved it. 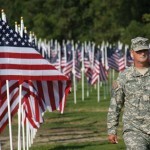 From A to Z, everything was arranged and taken care of. All we had to do was enjoy. We’re already looking at www.holidayvacations.net/discover to plan our next once-in-a-lifetime adventure. 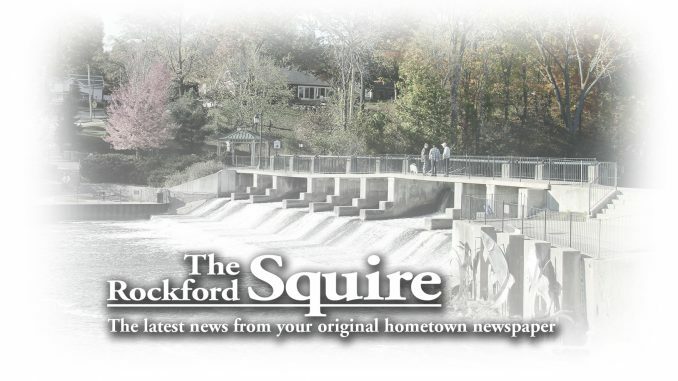 The Squire has been Rockford’s free weekly newspaper since 1871. Our loyal readership includes over fifteen thousand homes in the Rockford area, including the affluent Lakes area of Lake Bella Vista, Bostwick Lake and Silver Lake; Belmont, Blythefield, as well as Algoma, Courtland, Cannon and Plainfield Townships. The Squire is distributed through the U.S. Post Office every Thursday. We also deliver to in-town businesses and homes with paper carriers and news stands in our grocery stores and over thirty local shops.